Our integrity, tenacity, expertise and our “client first” culture separate us from the crowd of typical insurance agencies. They offer insurance polices, we deliver solutions. In addition to being an owner of The Christi Insurance Group, Eric McDowell runs the Marine Insurance operations. He possesses both a master's degree in business administration and a USCG captain's license, as well as sixteen years experience specializing in marine insurance. Greg Jones earned his USCG captain’s license at age sixteen and has thirteen years experience of providing marine insurance expertise. Ryan Johnson grew up boating and served as captain aboard a private corporate yacht. He has twenty years of boating experience and twelve years of offering professional marine insurance solutions. We recently had a yacht owner incur over $400,000 of damage to his Viking 56' as a result of Superstorm Sandy, after purchasing the yacht six days prior to the storm. The insurance company initially advised the client that a $120,000 windstorm deductible would apply since the damage was due to "Hurricane Sandy". We were not in agreement with the company's position. After conducting research regarding the official designation of the storm, we determined at the time the storm caused damage to our client's vessel, it was officially designated a Post Tropical Cyclone by the National Weather Service. The policy clearly defined the definition of "windstorm" as a Tropical Depression, Tropical Storm and/or Hurricane. We then presented our case to senior management that the significantly higher deductible could not be invoked. The carrier quickly responded that they were in agreement with our position that the standard $12,000 deductible would apply. The satisfaction of calling a client to advise that we were successful in saving him $108,000 was very rewarding. Another example is a recent lightning strike. The insurance company had initially requested that all of the damaged electronics be returned to the manufacturer to determine if the units could be repaired. This is not an uncommon request. We felt this was unacceptable as the turn around would be 4 to 6 weeks. Our close relationship with electronics company enabled us to convince the carrier to allow the repair company to determine if the units could be repaired or replaced. The repairs were completed in two weeks instead of two months. A client's claim was originally declined due to an error on his behalf of not providing updated information for a new captain. The amount of the claim was $125,000. The carrier was an A++ rated U.S. based company. Our influence and relationship resulted in the carrier making its largest claim exception to date. The insured was paid $125,000 less deductible. 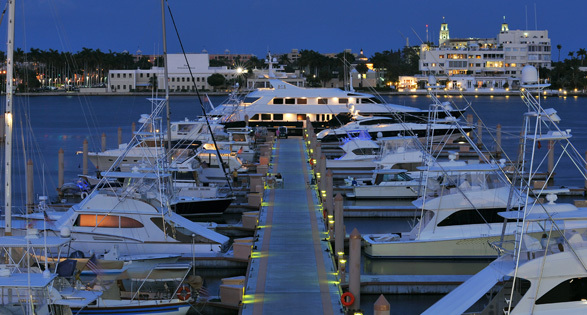 I received a call from a client on a Sunday that incurred significant damage to his yacht in the Bahamas. I instructed him how to proceed and made arrangements to have the boat towed to Florida. Occurrence of claims aren't limited to 9 to 5, Monday thru Friday, when most agencies are open for business. We make ourselves available 24/7. A client recently incurred fire damage on a 55' yacht. I flew to Savannah, GA to personally inspect the boat and meet with the insurance company's surveyor and boat yard personnel. The surveyor complimented me on my knowledge. It is the surveyor that reports to the insurance company and typically approves the repairs. Thus, it is of great advantage to develop a good rapport. My inspection included crawling around a soot filled engine room making comments to the surveyor and yard manager regarding the repairs. Most insurance agents, if not all, would never go out of their way to get this involved in a claim. Most would not be aware of what they were looking at. Our number one priority is to make sure your boat is repaired to the highest standards with as little burden as possible to you. If you're contemplating if it would be more convenient to place marine insurance coverage with a local agent or the agent that provides your business or personal insurance, or even the agent that currently provides your boat insurance coverage, don't make that mistake. Claim service and expertise should be your number one concern. The fact that Christi Insurance is one of the largest marine insurance agencies in the country provides us with a significant advantage in servicing our clients.